In my previous post, I said that I was avoiding the task of assembling reading goals for this year. But, as I also said, I’m committed to read 70 books in 2012. Nana of ImageNations and I were tweeting about our “low” numbers in 2011, one thing led to another and soon out pops the number 70. Now I feel that without some structure, I may not make that number. 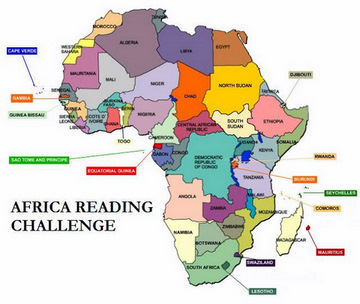 Enter reading challenges. I’ve selected my usual favorites and some other fun ones. I’ll probably cover them all in two posts. This will be my third year of doing this challenge and I believe these categories are the hardest and trickiest to date. I congratulate the host, Beth Fish Reads, for coming up with them. It’s going to be fun. As always, participants are encouraged to be creative in matching books to the categories. My perennial challenge to read 100 short stories in a given year. To help with this challenge, I usually review short stories on Mondays. These are books from my shelves. I will have to find books by women. Challenge runs from January 1st, 2012 through December 31st, 2012 (but a technicality extends this to January 15th, 2013 :)). Now I have to make a list of 12 from my wishlist. List making – it never ends! That’s it for now. I will probably sign up from 4 more challenges. I’m thinking of a chunkster, a classic and a quirky/fun one. All the challenges allow overlap and I’ll take full advantage of that! Are you signing up for any challenges this year? Do you have any suggestions for the categories of What’s in a Name 5? BTW, is a chameleon considered a creepy crawly? Great challenges, I have full faith in your abilities to complete them all, or to at least enjoy the reading that you do for them! Thank you, Amy. At least I’ve picked the ones that I’m certain to enjoy. Interesting commitment with what you and Nana have started. I will be looking forward to your reviews. Thank, Geosi. I hope to prevail. yes, a chameleon can be a creepy thing. lizards are creepy to people. Good luck with your challenges. Thank you. That means I can read The Book of Chameleons by Jose Eduardo Agualusa for the challenge. Good luck with your hosting duties. I will be hosting one myself this year and I hope that I’m up to the task. Thank you Stu. I know that you really liked Glorious Nemesis; I’m starting with that first. The book design is charming and I am such a fan to Czech Lit. Finally, you are resisting after signing up for 52, 52 challenges this year :). I’ve found quite a number of books with “book” in the title so I’m covered in category 5. I have two books that might fit the creepy crawly category – The Book of Chameleons and Arrival of the Snake-Woman and I really want to read the Chameleon book. Good luck to us both. I have signed up for a few challenges this year that will take me outside of my reading comfort zone – classics, speculative fiction, and a mixing it up challenge with a variety of genres. I’m looking forward to what 2012 brings. Me too. I will sign up for a classics challenge. Speculative fiction, not there is a challenge! Enjoy your reading this year. My participation in external challenges is always minimal and when I do I sometimes don’t remain active. I told you I’m joining you on the 100 shots of short. I know you are joining me on 100 Shots of Short. I love the concept of the Eastern European challenge! Although I would be hard-pressed to come up with books to read to fit it, lol. Wow, thanks for opening my eyes to online readinglists! I never knew! I for one will reread some books too. And maybe also read more shortstories. Sadly, my work and studies make reading my work which means less time for reading fiction. So enjoy your 70 books and tell us about them in this space! If I had to read so much for work, it would seriously cramp my reading style :). Do enjoy your casual reading this year as well. Great to have you take part in the wishlist challenge, Kinna. I’m sure 12 books should not be a problem. But there are other challenges… I hope you’ll manage to do them all. 100 short stories sounds a lot (but then, I’m not a short story person). I remember reading The Good Soldier Svejk years ago and it was really good fun (or was it very sad? No, I think it was fun).